STARBLAST- up to 30 times less dust than OSHA standards permit! 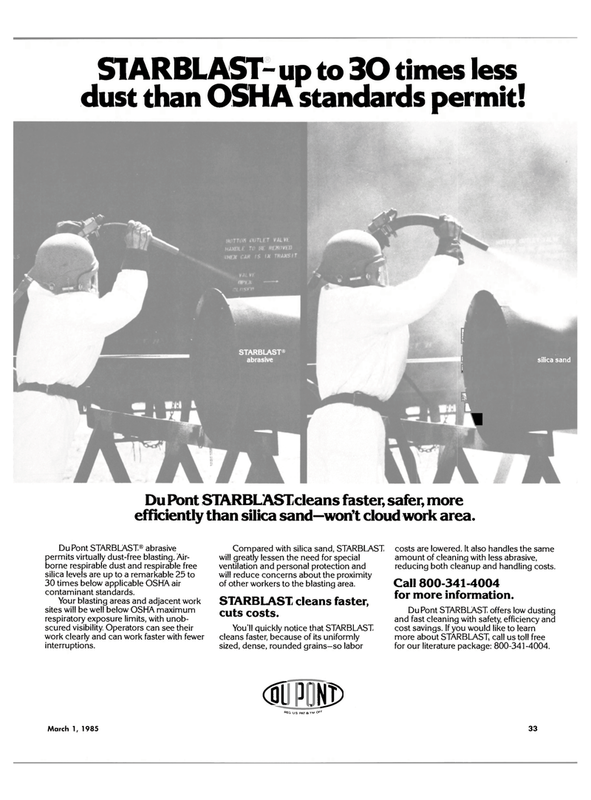 Du Pont STARBLASTcleans faster, safer, more efficiently than silica sand—won't cloud work area. DuFont STARBLAST® abrasive permits virtually dust-free blasting. Air- borne respirable dust and respirable free silica levels are up to a remarkable 25 to 30 times below applicable OSHA air contaminant standards. Your blasting areas and adjacent work sites will be well below OSHA maximum respiratory exposure limits, with unob- scured visibility. Operators can see their work clearly and can work faster with fewer interruptions. Compared with silica sand, STARBLAST will greatly lessen the need for special ventilation and personal protection and will reduce concerns about the proximity of other workers to the blasting area. STARBLAST cleans faster, cuts costs. You'll quickly notice that STARBLAST cleans faster, because of its uniformly sized, dense, rounded grains-so labor costs are lowered. It also handles the same amount of cleaning with less abrasive, reducing both cleanup and handling costs. Call 800-341-4004 for more information.